Come see this gorgeous 12th floor condo with direct river views in Pointe Royale. This unique floor plan features a built-in storage area in the foyer as well as a fabulous den with a custom glass block window. The kitchen has a one of a kind kitchen nook with river views! With 3 wrap around balconies and stunning views from every vista, it is truly one of the best locations in Fort Myers. Great sunset and city view at night too! The flooring has been recently updated and the balance of the condo has been meticulously maintained. Hurricane shutters are also installed for your convenience and a new A/C was installed in 2017. 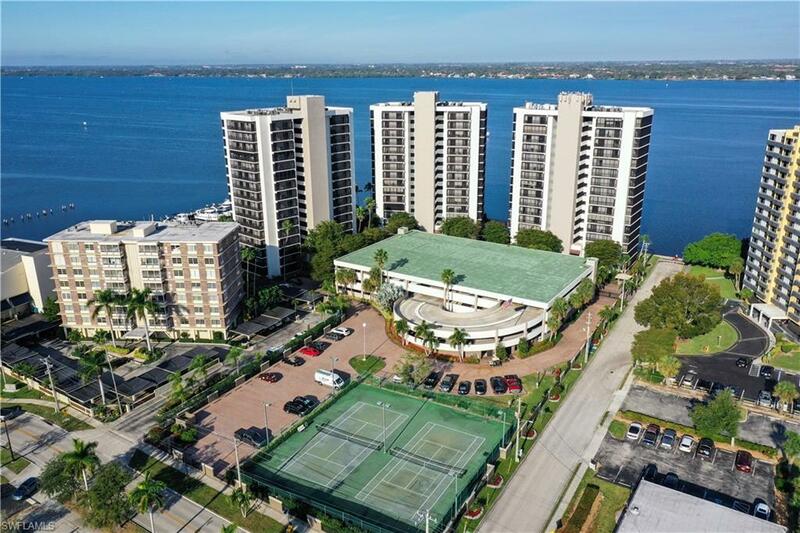 Fabulous amenities include 24 hour gated entrance, wonderful heated pool, community room, exercise facility, fishing pier, dog run, tennis courts, secured garage parking and car wash area - just to name a few. And included in the Quarterly HOA fees is Xfinity cable and high speed internet, water, sewer, trash removal & a full-time onsite manager. From this fantastic location you are within walking distance of Downtown Fort Myers, Edison/Ford Estates, grocery and restaurants. Please make your appointment today to see this fabulous unit.